Just to give you all advance notice that the Club’s Ladies Section will be hosting their annual Greensomes (aka Pink Day) on Sunday 4th October with tee times from 8.30am – 1pm. Or members can go through the normal BRS links. All proceeds will be donated to Breakthrough Breast Cancer and we’re looking to beat last year’s fantastic total of almost £1,200. We are determined to top that amount in 2015 and as always, we’re looking for new ways to raise funds for this great cause. This year, Jean and Gordon Johnston have pledged to donate either £10 for every person who birdies the 16th (or better! ), OR £5 for every person who has a 2 (or better!) at any other hole on the course, whatever is the largest amount. Gordon is a member and Jean is a past member (sadly, she had a stroke and has had to give up golf) – their very generous offer is a great start for us. One of the main ways we raise money over and above entry fees is through a raffle and we’d really appreciate donations of prizes (or just money!) which will help us maximise the funds raised. So if you’d like to help support our Pink Day and more importantly, Breakthrough Breast Cancer, please drop any prizes or donations into the office. 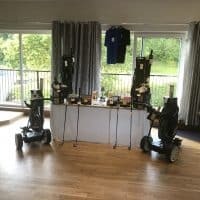 Not forgetting the golf, we will have great prizes for all of the winners, plus, of course, a number of feature holes with excellent prizes to be won. Please also look out for raffle tickets which will be available soon. 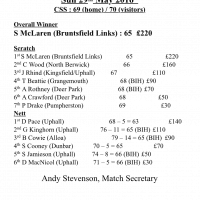 20th Professional’s Day results and round-up.